... Merritt Island: Home of Cape Canaveral Air Force Station and Kennedy Space Center; hard by Patrick Air Force Base and the launch operations of major aerospace contractors Boeing, Lockheed, and McDonnell Douglas. After finishing high school in Florida, Koellner worked at secretarial jobs, steadily moving up to a Legal Secretary position. Always interested in business and management, she attended college at night to earn a Bachelor of Science degree in Business Management. Then, while she was working in a co-op student job with the government at Patrick Air Force base, a recruiter from McDonnell Douglas called. Koellner went to the interview "just for the experience." She had already started work at night school toward her Master's and "had no intention of leaving" the U.S. federal government co-op job until she finished the degree. But the opportunity was too good, and Koellner indeed left the employement of Uncle Sam. Starting work at McDonnell Douglas as a budget analyst, she quickly moved to a position in Contracts, finishing her MBA degree at Stetson University in Deland, Fla., at night, courtesy of the Learning Together program. Koellner's subsequent search for increasingly responsible positions within the company was both frustrating and cathartic. On several occasions jobs she had targeted disappeared because of internal reorganizations. Although at first disappointing, in the long term it proved to be a huge benefit, she said: "It caused me to shift how I viewed my career. Instead of targeting specific jobs I started identifying parameters around things that I'd really like to do." Things like jobs involving large-scale process improvements or companywide functions. "When you define your objectives in those kinds of terms instead of a specific career path, it leads you to a lot of different places [you] never would have gone otherwise," Koellner said. The experience also helped form a philosophy that has become central to her business style: "looking at everything that comes your way as an opportunity and discovering how best to take advantage of that opportunity," including major organizational changes or shifts. It also underscored the benefits of working for a big company. People "can have multiple careers over their work life without ever having to leave" Boeing, Koellner said. 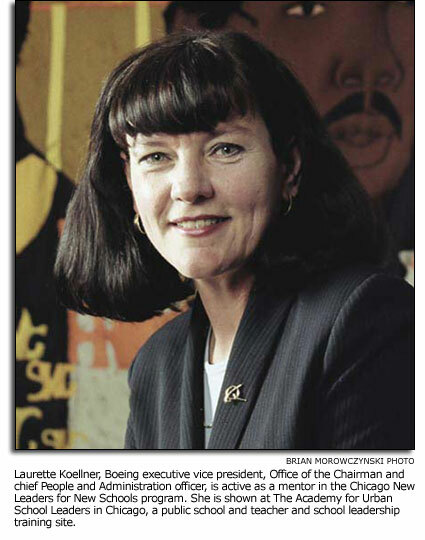 During the course of her career at McDonnell Douglas, and after the company merged with Boeing, Koellner has practiced what she preached, including several job changes that were considered lateral moves. But they helped her gain new and different job skills and experience. "Once people see you operate and demonstrate skills in more than one role, they are able to think of you for other jobs as well," Koellner said. Today, Koellner is executive vice president, a member of the Office of the Chairman, and chief People and Administrative officer for The Boeing Company. Some of her many responsibilities include leading People and labor strategy, People services, diversity, leadership development and community relations. She provides strategic guidance to the Shared Services Group. She also heads up World Headquarters administration, is a member of the Boeing Strategy and Executive councils, and is responsible for international relationships with Africa, the Americas and Russia. Last month, Koellner assumed Dave Swain's Office of the Chairman duties as a result of Swain's move to St. Louis to become chief operating officer of Integrated Defense Systems. She will carry out those responsibilities until a replacement for Swain is named. In January of this year, Koellner was elected to the board of directors at Sara Lee Corp., a major consumer and food products company. She also is a mentor in the New Leaders for New Schools Program in Chicago. It promotes improved academic achievement for schoolchildren through improved training and support for school leadership. To spool down from her busy, pressure-cooker schedule, Koellner likes to spend time with her family and rides motorcyclesthe big kindwith her husband, Victor. She also roller-blades and is an avid jogger. The couple has one daughter, Stacy-Anne, who's a senior in college. Now that she holds one of the top positions at Boeing, Koellner intends to focus on helping boost employee involvement and engagement. There is a "tremendous" untapped human potential at Boeing made possible by advances in Information Technology. "People at all levels of the company, instead of just top leaders, now have access to information. So how can we empower people to make more decisions and better decisions at their level?" she asked. "If we can redesign our jobs so people become more involved, more engaged, then there's no stopping us."